For further details click anywhere on this image. Pharmaceutical Equipment validation or qualification to FDA cGMP standards, can be quite simple to achieve providing the procurement stage has been thoroughly investigated and concisely documented in accordance with a company approved process. The procurement process normally starts with the production of a documented requirement or group of requirements (URS). For new builds this must be incorporated into the originating validation or project plan (VP). For existing facilities this should take the form of a CHANGE REQUEST (CR). As soon as management has agreed to proceed with the CR, approval should be issued to produce a VP. This plan must be all encompassing. It must give assurance that all aspects of the proposed CR have been studied and the CR impact on existing facilities, utilities, product and personnel have been defined and the appropriate corrective or support actions planned for. A fully detailed User Requirements Specification (URS) can now be authored reviewed and published. Since developing the URS may raise problems that could not be anticipated when the VP was raised; there must now be a VP review to ensure all aspects of the final approved URS are authorized and planned for. Perform as specified in the URS. Conform to all mandated cGMP requirements. Operate in a manner safe to the product, and the operations staff. The installation of each validateable system must be subjected to, and satisfy, a pre-approved Installation Qualification (IQ) protocol. When the requirements of the IQ have been satisfied, all aspects of the operational capabilities of each system must be fully challenged and verified by the execution of a pre-approved Operational Qualification (OQ) protocol. As soon as the executed IQ and OQ protocols having been reviewed and approved, a pre-approved Performance Qualification (P1Q) protocol or Process Qualification (P2Q) (this requirement will be documented in the VP) must be issued for execution. The execution of this PQ must verify that the system performance requirements, as specified in the URS have been achieved, and that the system operates in a manner safe to the product and production personnel. PLEASE CLICK HERE TO GO TO SHOP. All validation and qualification relates to a regulated product either directly or indirectly. Indirect pharmaceutical equipment validation; refers to the validation and qualification of all equipment that must be in place to support the direct equipment and or is required to deliver any specific environmental conditions specified in a process in use. 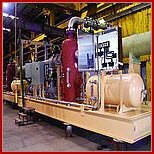 (process air/water/HVAC/isolation etc). You have a new product and you are tasked with the pharmaceutical equipment validation for the entire project. Along with the facilities and utilities, being put into place to manufacture this product. Diagram 1. 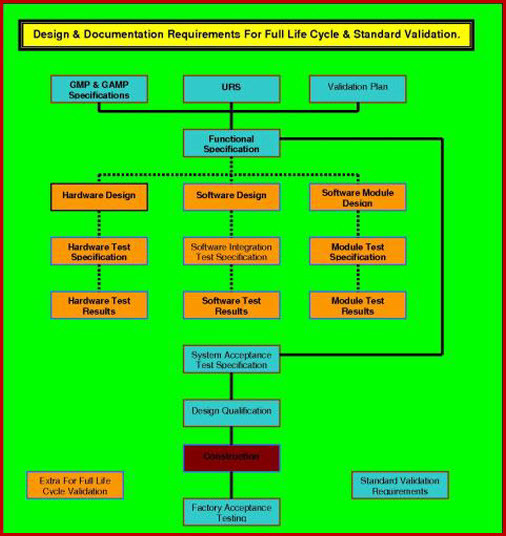 Full Life Cycle Validation (FLCV). Validation Master Plan (VMP) gives an overall depiction of the company facilities, along with the management structure, and details of how cGMP is, or is to be, integrated with all company activities. On the other hand the pharmaceutical Equipment Validation Plan (VP) is used to manage pharmaceutical equipment validation and qualification projects that are smaller in size and have easily defined boundaries. Raise the appropriate Validation (Master) Plan (VMP/VP) as described in https://www.validation-online.net/validation-master-plan.html or purchase, and download and edit one from "http://quality.validation-online.net/validation-documentation.html" Complete all requirements and circulate draft copy of document for peer review. Incorporate all circulation comments and submit for approval. Issue document for project management use. This comprises document One of the set of Eight required for Pharmaceutical Equipment Validation. Task 2. Introduction to Matrix. 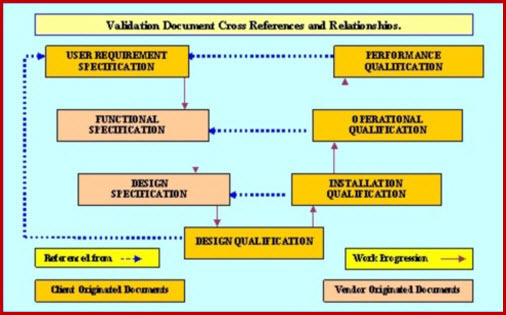 Raise a Validation and qualification Documentation Matrix (10000002) chart as described in https://www.validation-online.net/validation-documentation-matrix.html or purchase and download one from "http://quality.validation-online.net/validation-documentation.html" and in the ‘description’ column, list all equipment that requires to be reviewed for validation assessment. As far as possible where equipment operates as a system, it should be listed as a system. Where it does not, or can not, then list individual equipment. For each listing raise individual User Requirement Specifications. Either author one in accordance with https://www.validation-online.net/user-requirements-specification.html or purchase and download one from OUR DOCUMENT SHOP. Issue document for project management use. This comprises document number Two of the set of Eight required for Pharmaceutical Equipment Validation. Date execution reviewed & accepted. The above data would normally be monitored and controlled from a planning schedule (such as Microsoft Project as shown on Diagram 3), however it is important to have this matrix in place as the master record of all project details. As items are added to the matrix, a unique number is allocated to each one, in Column 1. This is the pharmaceutical equipment validation number, individual protocols are subsequently identified by adding the document acronym to the end of the unique number. This way all validation documents for an item have the same identifying number. Progressively subject each item listed in the matrix, to the questions in the Validation Risk Assessment (VRA), which should either be authored in accordance with https://www.validation-online.net/validation-risk-assessment.html or purchased and downloaded from http://quality.validation-online.net/ . As each piece of pharmaceutical equipment validation completes the VRA and is given a risk rating, and an assessment for part 11 compliance, enter these ratings into column seven of the matrix, in the row allocated for the equipment. Format, (risk rating)(Y or N for part 11 compliance). Issue document for project management use. This comprises document Three of the set of Eight required for Pharmaceutical Equipment Validation. Risk Assessment (RA) in the pharmaceutical / biotech / medical device validation industry, is often misunderstood. In regulated industries RA’s are used for a many different purposes. In our case we are only considering the use of an RA to justify the depth and scope of our validation and qualification requirements. As such the VRA has to simply ascertain; what scope of validation this system / equipment qualification must be subjected to, to ensure it is correctly validated, and whether the system has to conform to 21 CFR Part 11. Task 4. User Requirement Specification (Sections 1) (URS). For each system/item listed in the matrix raise a user requirements specification as (URS) as described in https://www.validation-online.net/user-requirements-specification.html or purchase and download one from http://quality.validation-online.net. Register each URS by giving it a unique number and entering that number into the matrix column. Circulate the registered URS templates to the individual equipment owners as specified in the project VP/VMP. Request owners complete section one of URS. Issue document for project management use. This comprises document Four of the set of Eight required for Pharmaceutical Equipment Validation. Task 5. User Requirement Specification (approval), (URS). On complete of Section One requirements, the URS must be reviewed and approved. The approved URS must then be forwarded to the procurement team. It is the procurement team’s responsibility to ensure that each individual invitation to tender, has the appropriate URS attached. Issue document for project management use. This comprises document Five of the set of Eight required for Pharmaceutical Equipment Validation. Task 6. Design Qualification (DQ). Ensure all preceding documents are signed off and approved. in accordance with https://www.validation-online.net/design-qualification.html or purchase and download one from http://quality.validation-online.net . The approved DQ must be executed to validate that the design is robust and has been subjected to sufficient proof of concept testing, to establish that if proceeded with, it will satisfy the requirements listed in the URS. Issue document for project management use. This comprises document Six of the set of Eight required for Pharmaceutical Equipment Validation. Task 7. User Requirement Specification (Sections 2 ) (URS). The URS top level functionality is further broken down into sub-functions in the Design Specification (DS). The vendor must therefore complete Section 2, of the URS, documenting the relationship between the URS functionality and the actual design functionality. This is required to enable compliance with the requirement for maintaining the traceabilty from URS to software code, as further described in Task 9. Issue document for project management use. This comprises document Seven of the set of Eight required for Pharmaceutical Equipment Validation. Raise an Installation Qualification as described in https://www.validation-online.net/installation-qualification.html or purchase and download one from http://quality.validation-online.net/ Complete all requirements and circulates draft copy of document for peer review. Incorporate all review comments and submit for approval. Ensure all preceding documents are signed off and approved, prior to executing this document. Issue document for project management use. This comprises document Eight of the set of Eight required for Pharmaceutical Equipment Validation. Raise an Operational Qualification as described in https://www.validation-online.net/operational-qualification.html, or purchase and download one from http://quality.validation-online.net/ Complete all requirements and circulates draft copy of document for peer review. Issue document for project management use. This comprises document Nine of the set of Eight required for Pharmaceutical Equipment Validation. Raise an Performance Qualification as described in https://www.validation-online.net/performance-qualification.html, or purchase and download one from http://quality.validation-online.net/. Complete all requirements and circulates draft copy of document for peer review. Issue document for project management use. This comprises document Ten of the set of Eight required for Pharmaceutical Equipment Validation.